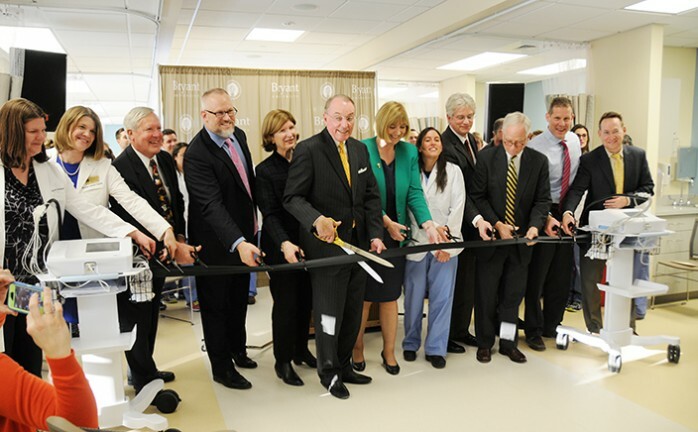 April 8, 2015 - Bryant University's new Physician Assistant Learning Center held its Ribbon Cutting and Grand Opening ceremony on March 2nd in the facility. The event featured speeches from Bryant's President Ronald K. Machtley (center) and Jay Amrien (3rd from left) the Director of the Physician Assistant Program. Chris Ladds (4th from right), Kathy Bartels, and Jonathan Taylor attended the event on LLB's behalf to celebrate the opening. LLB designed the space working with Lavalle Brensinger Architects, specialists in healthcare design, to accommodate the programs unique needs. Working collaboratively with the university to program, plan the building that includes simulation laboratories, lecture classrooms, and office for faculty and staff.